Guru Angad Dev Veterinary and Animal Sciences University, Ludhiana celebrated the Republic day with patriotic fervor and enthusiasm at the university campus. Dr. Amarjit Singh Nanda, Vice-Chancellor, Guru Angad Dev Veterinary and Animal Sciences University, was the chief guest of the function. He extended his congratulation on 70th Republic day of country. Dr. Nanda unfurled the National Flag at the parade ground and highlighted the importance and spirit of the Indian Constitution for the development and prosperity of people. R&V Sqn. NCC cadets of GADVASU presented the guard of Honour. Dr. Satyavan Rampal, DSW also escorted Dr. Nanda. 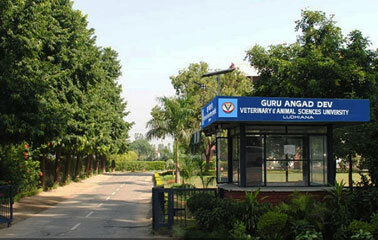 Emphasizing on the role that a University can play in a nation’s progress, Dr. Nanda said Guru Angad Dev Veterinary and Animal Sciences University, Ludhiana as a premier Institution of veterinary education is playing a significant role by excellent teaching, problem solving research with exhaustive and rigorous extension activities. University achieved first position among all the state agricultural and veterinary universities in India within very short time period, since GADVASU came into existence in 2006. He told that university is working on more than 100 research projects. He informed that we are developing extension services in such a manner that this will enrich services to the livestock farmers of the state in a holistic manner. Further, he explained that Honorable Chief Minister, Punjab, Captain Amrinder Singh ji recently visited GADVASU, observed the university activities and he appreciated and admired the efforts and work being carried out by the Veterinary Varsity. Dr. Nanda appealed to all the staff and students, since University achieved No.1 status, now its responsibility has increased manifolds and all have to work hard and dedicatedly to come out to the expectations of the people. Students were honored for their achievements in different extracurricular activities. Students and staff members filled colors, emotions and rhythm with their performances in the function. Officers, Teachers, Employees and students of the University attended the function enthusiastically.